If you’re looking for a recipe for pesto using fresh basil, then you’re in luck! 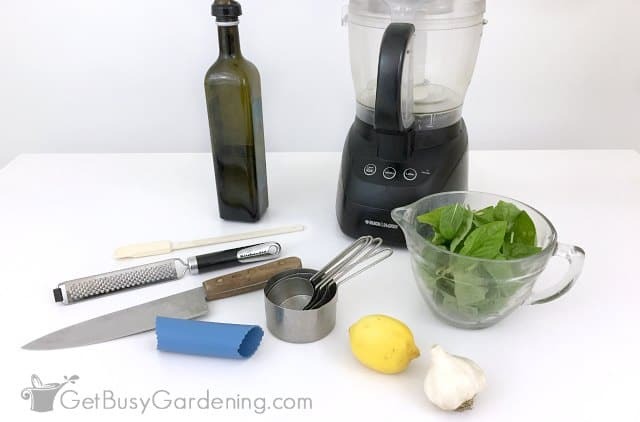 In this post, I will share my easy pesto recipe (without nuts or cheese), and show you exactly how to make basil pesto with fresh basil from your garden or the store. I love garden fresh basil, it’s such a wonderful treat during the summer and I grow it in my garden every year. I also love making pesto to freeze for winter use. I don’t like the taste of pine nuts, and so many traditional pesto recipes have nuts and cheese in them. So, I decided to create my own, quick and easy basil pesto recipe without nuts and cheese. That way I can whip up a batch whenever my basil is ready to harvest from the garden. You can use my recipe for making pesto whether you grow basil in your garden, or buy it from the store. This basic pesto recipe has only four ingredients, and is super easy to make. 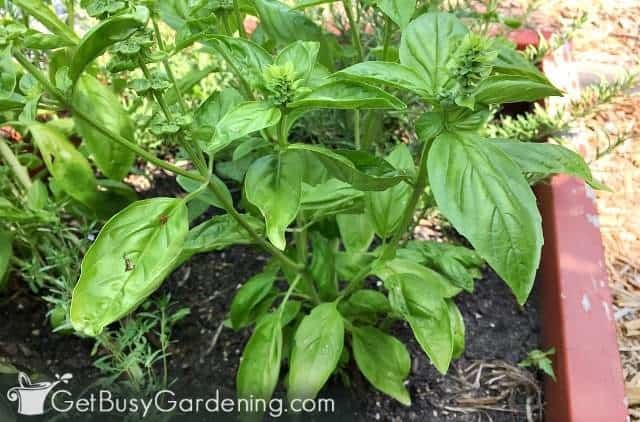 Before I show you how to make basil pesto, let’s talk about some different types of basil. The main ingredient of pesto is basil, and there are lots of different varieties to choose from. Traditional basil pesto is made using a sweet variety, like Genovese basil or Italian basil. 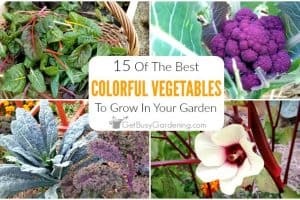 But you can also use other varieties, like purple basil, lemon basil or Thai basil for this recipe if that’s what you have growing in your garden. Heck, you could even try mixing the different varieties if you want to experiment with flavor combos. Just keep in mind that each of these varieties has a different flavor, so they will definitely change the flavor of your basil pesto. It’s fun to experiment, but if you want to make a classic basil pesto, then stick to using sweet basil. If you’re planning on using basil that’s growing in your garden, it’s important to know how to harvest it so that it’s as fresh as possible for making pesto. So below I’ll share a few tips for how to prepare basil for pesto. If you bought the basil from the store, then you can skip this next section. One of the best things about growing basil in the garden is that you don’t have to harvest basil all at once. 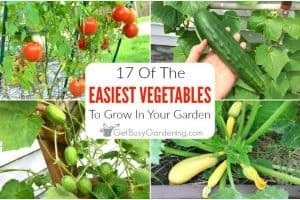 You can run out to the garden any time you want, and pinch off the exact amount of leaves you need to make your own pesto. But, if I have a large amount of basil that I plan to harvest all at once, I’ll grab a bucket of water before heading out to the garden. Then I will cut each basil plant off at the base, and put the stems into the water. Basil will start to droop pretty quickly after being harvested, so that’s why I put the stems into the water right away. That way I can take my time harvesting and preparing all of the leaves before making my pesto. 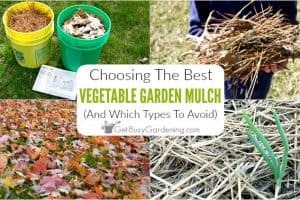 If you do this, just be sure the leaves aren’t soaking in water too long, or they can start to turn brown. Once harvested it’s best to clean and use the leaves as soon as you can, basil doesn’t store very well. 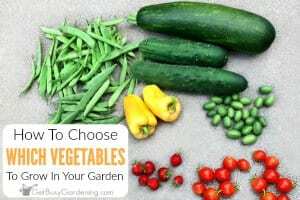 If you harvested the whole plant, strip off all the leaves and discard the stems. 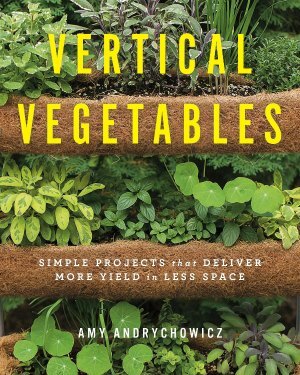 Only choose healthy leaves to use for making pesto, and toss out any that are yellow or brown. After they’re removed from the stem, rinse the leaves several times to wash off any bugs or dirt. Don’t allow the leaves to soak in water though, and be sure to dry them right away after rinsing them so they don’t turn brown. The best tool to use for drying the leaves after rinsing them is a salad spinner (best invention ever! ), but you can use a towel to gently pat them dry if you prefer. Now I get to show you how to make basil pesto! Once the basil leaves are dry, it’s time to make some homemade pesto! I like to use this basic basil pesto recipe to freeze for winter use. That way I have a nice base to start with, and I can eat it as is, or add whatever I want when I use the pesto for my recipes. This simple pesto recipe yields about 1/2 cup. Step 1: Prepare the garlic – Peel the garlic cloves by hand or use a garlic peeler, and then crush the cloves using the side of your knife. Set them aside. 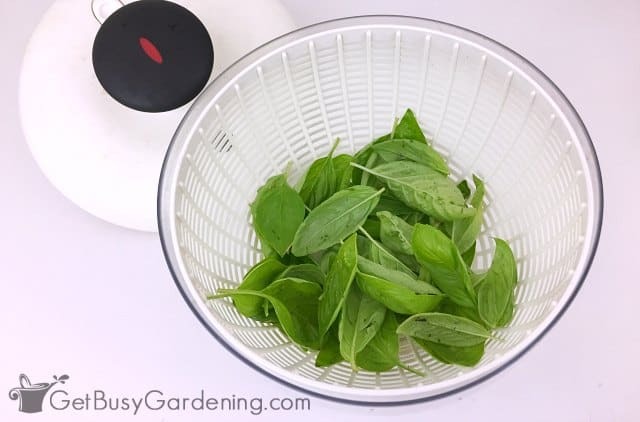 Step 2: Chop the basil leaves – Put all of the basil leaves into your food processor and pulse it several times to chop them up. Pulsing the leaves before adding other ingredients helps keep the consistency even. The leaves tend to stick to the side of the food processor, so use your spatula scraper as necessary to push them back down to the bottom. 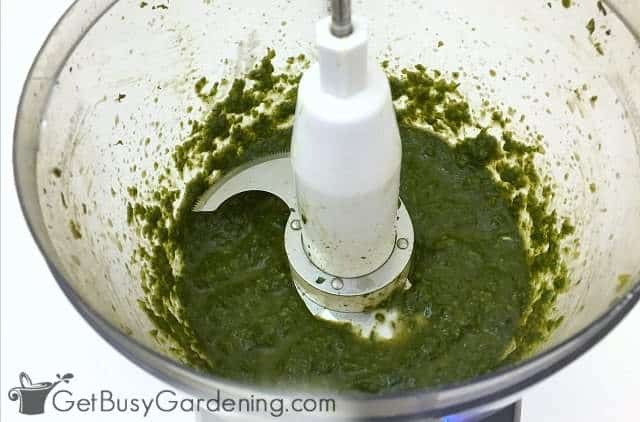 Step 3: Add the garlic – Drop all of the crushed garlic cloves into the food processor and pulse it again several times to mix it in with the basil leaves. Step 4: Slowly add the olive oil – Open the feed chute on your food processor and slowly drizzle the olive oil in as you continue pulsing. You can stop once and a while to open the top and scrape the sides to ensure all of the ingredients are being evenly mixed together, if necessary. Step 5: Add the lemon juice and zest – Pour the contents of the food processor into a bowl, then use your zester to zest the 1/2 lemon into the bowl. Then squeeze the lemon juice over the top. Stir everything together well. You can use your basil pesto right away, or you can store it for later use. If you plan to use it within a few days, then you can just store it in the fridge. Otherwise, it’s best to freeze it to keep it fresh, rather than risk leaving it in the refrigerator for too long. Freezing pesto is easy, and a great way to preserve your harvest! The best part is that frozen basil pesto thaws easily, and it tastes just as good as it did when you first made it. 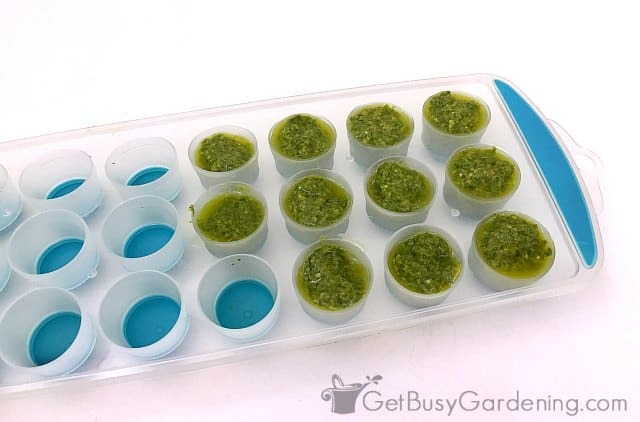 The best way to freeze pesto is to use ice cube trays. Once they’re solid you can just pop the pesto cubes into a freezer bag for long term storage. I use a mini ice cube tray that holds one tablespoon portions, which is the perfect amount for quick use in many recipes. 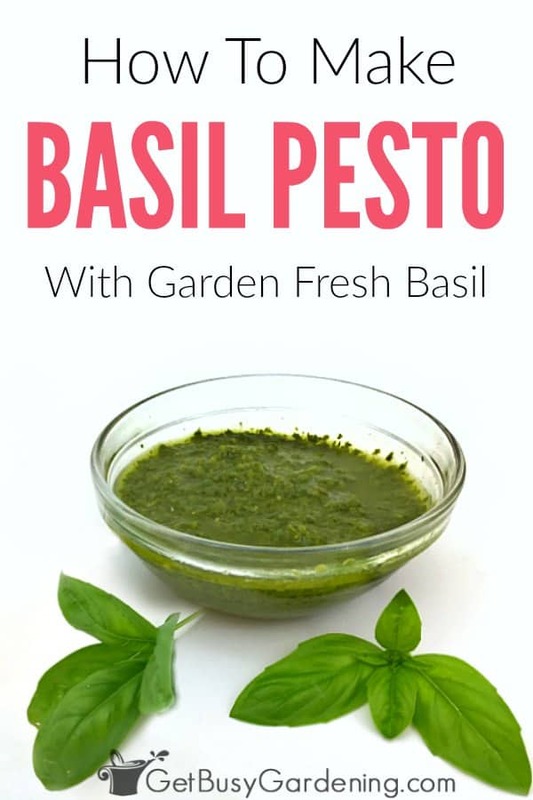 This is the best pesto recipe for beginners, or if you’re looking for a quick pesto recipe to use up all the basil you grew in the garden! It’s delicious, and making basil pesto without pine nuts and cheese is definitely healthier for you too. Now that you know how to make basil pesto, you can whip up a batch straight from the garden any time you want. 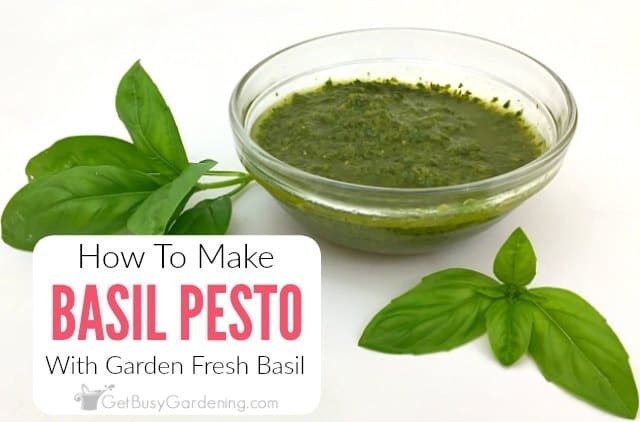 Share your tips for how to make basil pesto, or your favorite garden fresh basil pesto recipe in the comments below. There are not that many herbs in the garden quite as tasty as fresh basil or basil that's been made into pesto. A little part of me dreaded the basil harvest last week when I made pesto because of all the separating the leaves from the stalks and washing and drying. However, I have a little helper who did the stripping and washing and I did the processing into pesto. 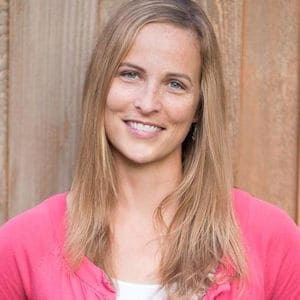 @FranksGreenGirl – I totally dreaded it too!! I've been so busy lately with other harvesting and preserving that I was thinking about letting the basil go. But last weekend, I thought… well this is a task I only do once a year, and I'll be sad not to have pesto in the freezer this winter… so I harvested the basil and got the pesto done! 🙂 I wish I had a little helper like you, cute!